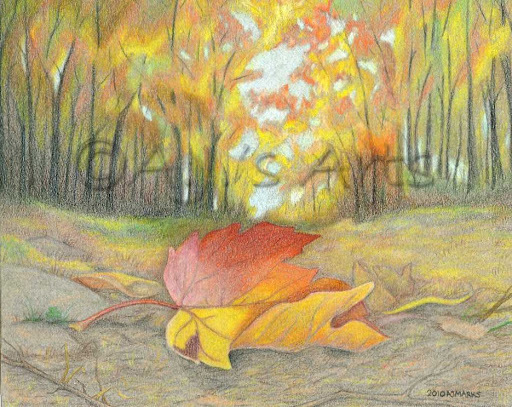 The Hive Autumn Challenge – Colored Pencil Autumn Scene | Who Are You Calling Crafty? I have been working on this drawing for over a week and came very close to not finishing this picture. It had been several years since I last worked with colored pencils and with time forgot how labor intensive they really are. I am happy to report I am very pleased with how this drawing turned out. As promised here are the progression photos and the finished piece. I came very, very close to stopping here. I even tried making it smaller (5″x7″) but my husband talked me out of it! The picture is 8″ x 10″ drawn with Prismacolor Pencils on Gray Canson Paper. « Irrational Fears… Scary Things!